I am endlessly amazed at how popular the Warriors series is in Germany and Holland. I mean, it’s way more popular than it is in the UK or the States. If you search Amazon.de, you can find all sorts of Warriors merchandise. Look at all this! Sticky notes, badges, notebooks, gloves…I have the laptop stickers and I love them. You can’t get any of this on the other Amazons (.com and .uk.co), trust me. I looked. Because I order my (English) Warriors books from Amazon.de, they send me emails when new Warriors items are released. 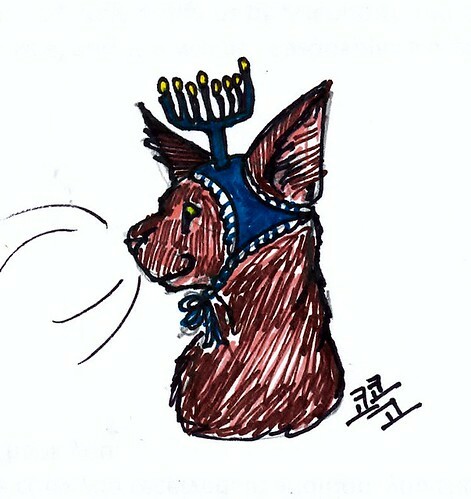 Usually, they’re translations of the series books in German, but a few weeks ago they sent me an email about an interesting book entitled Warrior Cats – Katzenzeichnen: Von den Grundformen bis zur Clankatze (Warrior Cats – Cat Drawing: From Basic to Clan Cat). 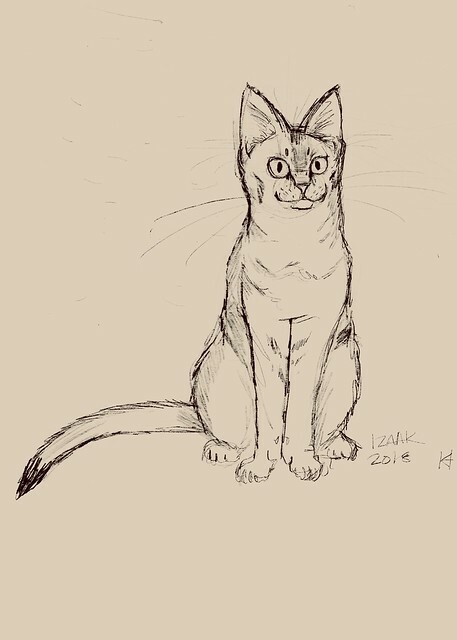 Now, I have been drawing cats for over 50 years, and apparently I’m pretty good at it, since people like the drawings I do. But this book is amazing, even for someone like me. Because you can always learn more drawing techniques. Look at the instruction on drawing paws (well, hands, if you’re doing Abys). 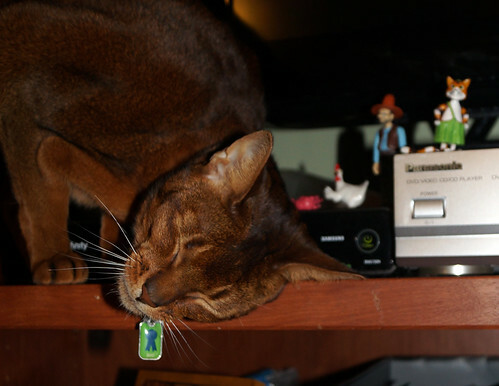 The book goes into great detail about all aspects of cat life, and it even has blank pages for you to practice on. Unfortunately for me, it’s in German, and it’s a translation of the original publication…in Dutch. So there is no English edition of this book yet. Considering that the original books were English, it’s a bit interesting that the Germans and Dutch have taken to the cats so much that they’re coming up with all kinds of original items and books that aren’t available in English! Using some of the book’s recommendations, I did this sketch of Izaak. What do you think? While I was in Sweden, I got a set of Pettson and Findus figures. I’ve had this small plush Findus since I visted Björn in 2000. 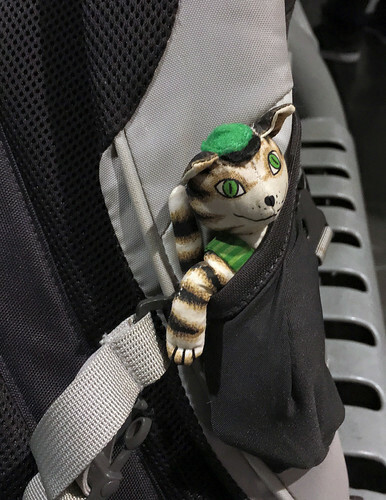 He went back to Sweden with me for Christmas. …I mean, what’s not to like? 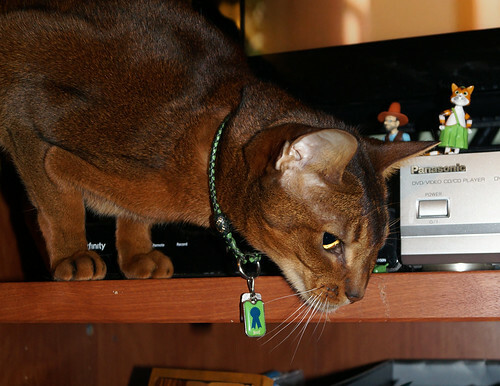 He’s a cat, he can talk, and he’s a sassy troublemaker. 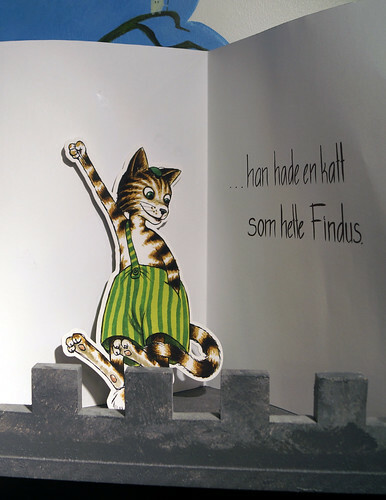 Someday, I want to get Jacoby a pair of green striped pants like Findus wears. I think Jake would make a great Findus. But what does Jake think of Pettson and Findus? As I mentioned a couple of cartoons ago, I am absolutely head over heels in love with Lackadaisy, a webcomic by Tracy J. Butler. 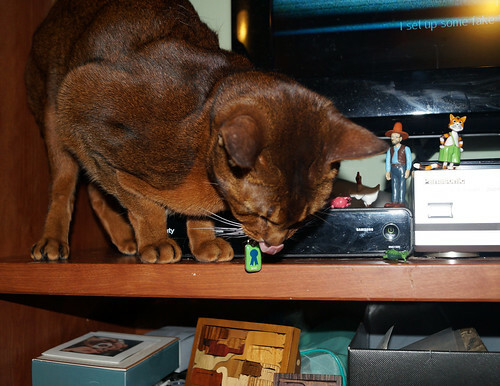 Imagine the 1920’s – bootleggers, gangsters, flappers…but with cats. I love Tracy’s intricate and detailed style and I could never hope to compare, but I did find this pastel illustration from a 1927 J.L. Taylor men’s fashion catalog which I could mimic. 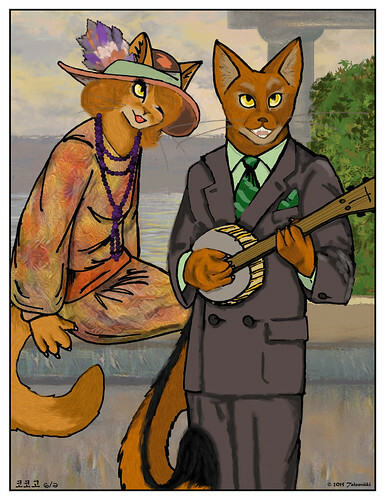 And so, here you have Jacoby and Angel as they might appear in a contemporary illustration in the Lackadaisy universe. 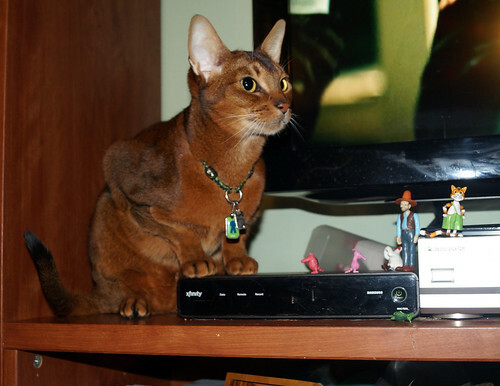 This is based in part on this photo from the Abyssinian Cat Club on Facebook. And it’s partly based on this expression tutorial, brought to you courtesy of the artist who does Lackadaisy. Since it’s Cartoon Tuesday, if you have any interest in cats, the Roaring 20’s, incredible artwork, pig farmers, or old photographs, you really should check it out. 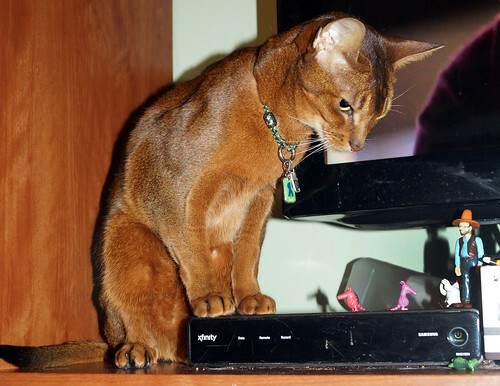 Of course, this has little to do with my cartoon, per se…but there are cats who drive in that cartoon, too. Seriously, though. 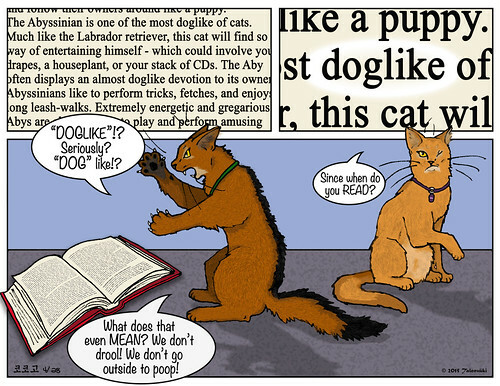 Awesome webcomic. And I suspect Viktor may be a Somali – there’s a photo where his complexion is described as “Ruddy”…Just sayin’. 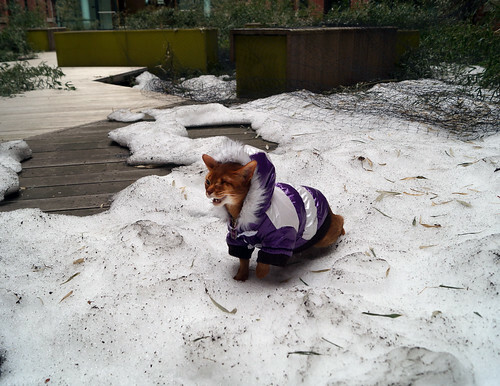 I actually got a chance to try out Angel’s new purple parka in some actual snow before it all melted away. I took these photos in our courtyard the day before Easter. 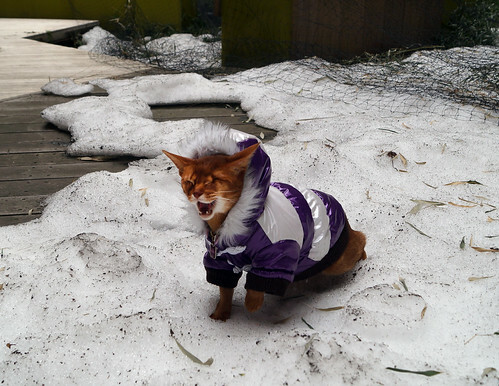 We still had a good amount of snow on the ground then, as you can see. 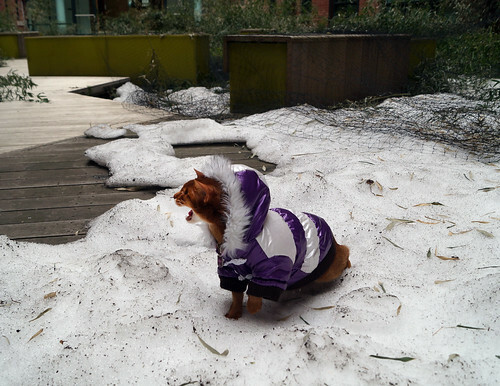 We actually still had snow in our courtyard as late as April 17. 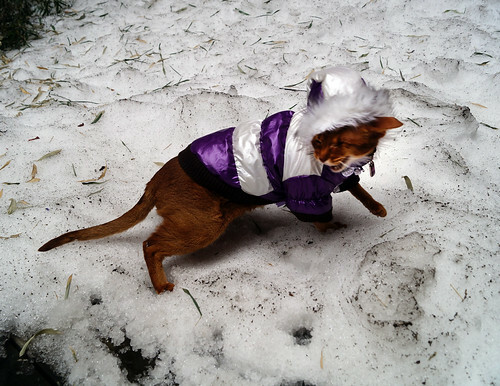 I took Angel out into the little snow patch so we could see how her coat stands up to real outdoor use. She meowed a LOT while we were out there…I am not sure if she missed Jacoby or if she was just especially chatty about being outside. 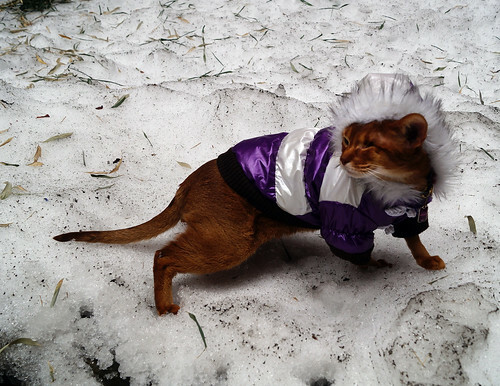 It was a quick outing, so I didn’t bother with her harness and leash. I did put on her undershirt though. The sleeves seem to be about the right length. I like the way the faux fur ruff frames her face. 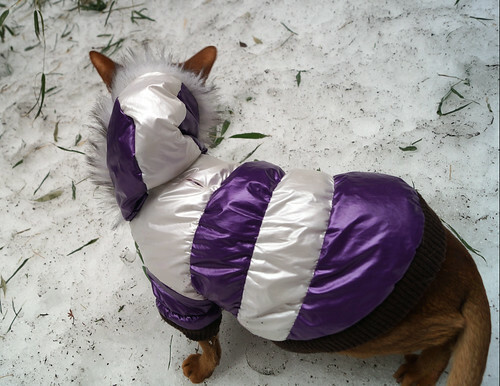 It really is a perfect coat for her. Here’s how it looks from the back. It seems like it’s a good length and covers her back well. And she can walk in it with no problems. 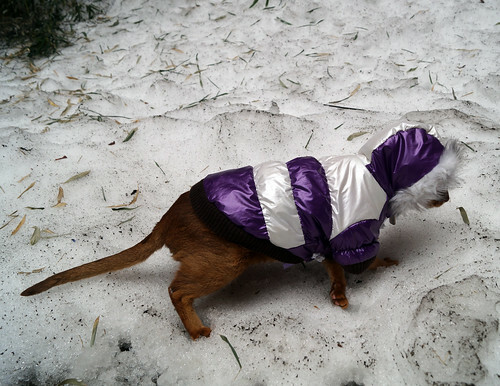 She may not like walking, but the coat doesn’t hinder her. Next step: boots! Speaking of fashionable Abys, I also wanted to share these photos of our friends Sanna and Sketsi strolling about on a spring day in Helsinki. Sketsi is modeling his bomber jacket and knit cap that Jake and I sent him in one of our box exchanges. Sketsi’s a boy. He just likes pink, but he’s secure in his neutered manhood. 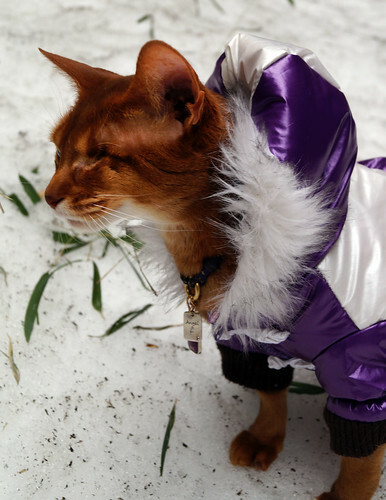 Sanna says that Sketsi is one of those males who can rock pink. He was seagull watching on this outing. There goes one now, apparently. He really likes his pink knitted cap from our friend Sara at ScooterKnits. And, speaking of Sara and her infamous cat hats…she’s written a how-to book with patterns to knit or crochet your own cat hats! How awesome is that? 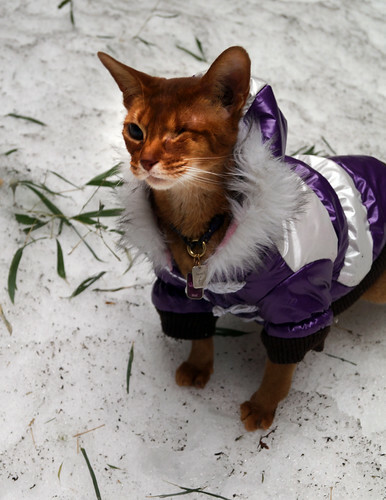 her book‘s cover model is none other than Vivi, a red silver Abyssinian! The book has patterns for the Pom-Pom and the Elf hats that Jake and Angel have…but the infamous Mistletoe hat is not included. I mean, there’s even a YouTube video about it! 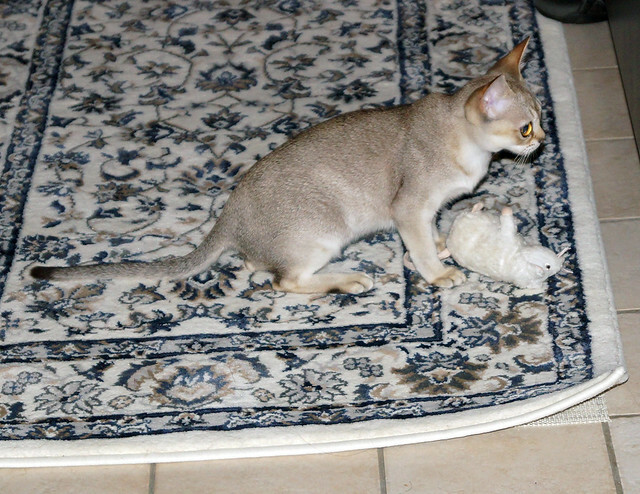 And while it is true that Abyssinians are one of the oldest breeds (going all the way back to 1860), and Abys have probably lived alongside humans for more of the breed’s history than other “natural” breeds (Abys are the first breed that was based on human’s desire to make a cat look a certain way rather than being based on a genetic trait like tailessness or thermo-restrictive partial albinism)…somehow, I don’t think they’d find being called “dog-like” exactly complimentary.